Gallia Academy senior Taylor Burnette passes the ball from the back row, during the Blue Angels’ straight games win over South Point on Thursday in Centenary, Ohio. CENTENARY, Ohio — Now that’s a game of connect four. 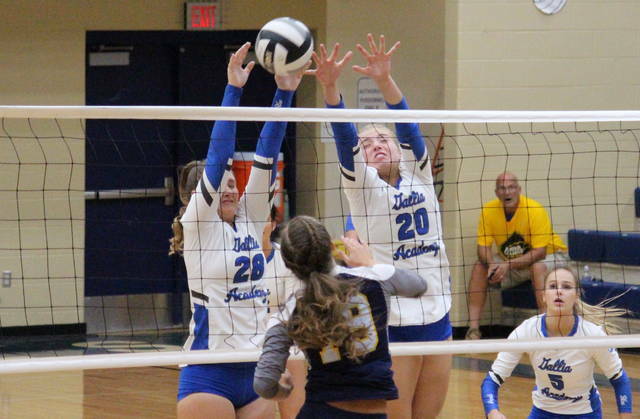 The Gallia Academy volleyball team clinched at least a share of its fourth consecutive Ohio Valley Conference championship on Thursday in its home gymnasium, as the Blue Angels claimed a straight games victory over guest South Point. 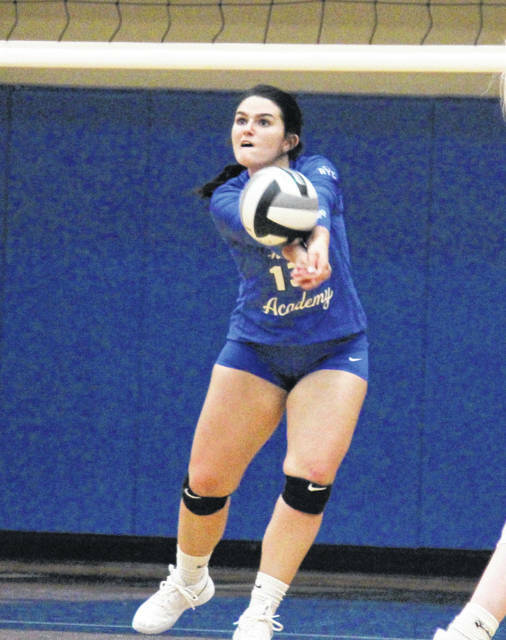 Gallia Academy (17-3, 12-0 OVC) — which has all-28 of its home OVC matches since joining the conference four years ago — extended its league winning streaks to 41 matches and 43 sets. South Point took its first lead of the match at 2-1 in the opening game, but the Blue Angels were back in front at 4-3. SPHS tied the game at six, and again at 12 before regaining the edge at 13-12. GAHS tied it at 13 and 14, and then ended the game with an 11-2 run for the 25-16 win. Gallia Academy took its first lead in the second game at 6-5 and never trailed again. The Lady Pointers stayed close for a while, trailing by just one point, at 14-13, when GAHS went on an 11-5 spurt to seal the second by a 25-18 count. 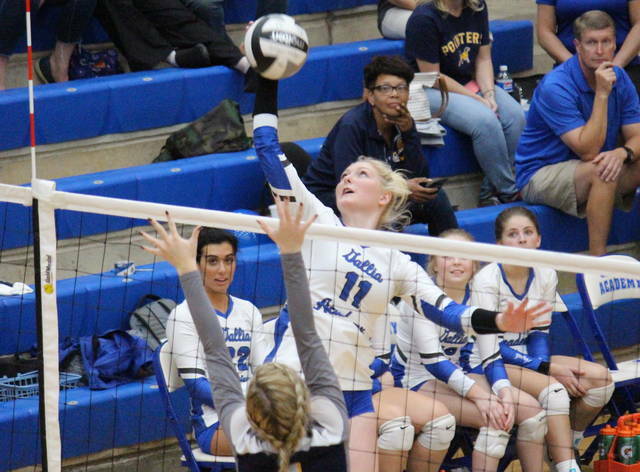 The Blue Angels trailed early in the third game, but took the lead at 4-3 and never looked back on their way to the 25-14 victory and straight games sweep. Following the championship-clinching victory, GAHS head coach Janice Rosier was happy for her team, and the four seniors who were able to earn the league title in the final regular season home match. GAHS finished with a side-out percentage of 64, while the Lady Pointers had a 41.9 side-out percentage. The Blue Angels missed 13 serves and had a 82.4 serve percentage, to go with nine aces. 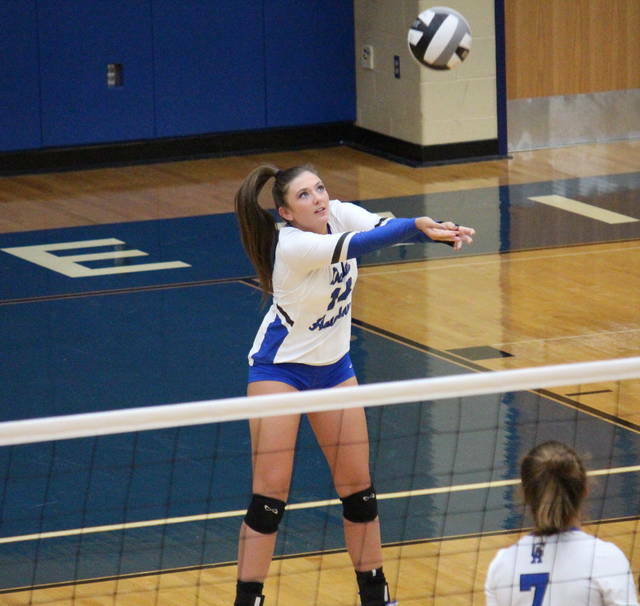 As a team, Gallia Academy had 42 kills for a hitting percentage of 34.5. The Lady Pointers had five aces and an 88.0 serve percentage, to go with 17 kills and a 5.9 hitting percentage. Gallia Academy was led by Alex Barnes with 16 points, including three aces. Ashton Webb had eight points and match-best five aces, Peri Martin chipped in with six points, while Hunter Copley added five points and an ace. Maddie Wright and Aubrey Unroe earned three points apiece for the victors, while Taylor Burnette came up with two. Webb led the hosts at the net with 18 kills, followed by Maddy Petro with nine kills and a block. Bailey Barnette had five kills in the win, Wright added four kills and a pair of blocks, while Martin had three kills and a match-high 36 assists. Barnes — who led the GAHS defense with eight of the team’s 30 digs — earned a pair of kills for the Blue and White, while Unroe had one kill and a match-best three blocks. Holly Ramey led South Point with seven service points and one ace. Rachel Wheeler was next with four points and two aces, while Sarah Allen and Kenzie Hargis had three points apiece, with an ace by Hargis. Brooke Bowen finished with one point in the setback, while earning a team-best 15 assists. Wheeler led SPHS with nine kills, while Allen had 15 of the team’s 27 digs. The Blue Angels also swept South Point on Sept. 6 in Lawrence County. GAHS will look to wrap its outright league title on Tuesday at Chesapeake.